Multiple Sclerosis (MS) is a disorder of the central nervous system (CNS) which includes the brain, spinal cord and optic nerves. 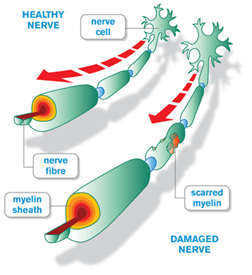 Nerve fibres are coated in a protective insulating covering called the myelin sheath—this serves a very similar function to the coating around electrical wires. Myelin is important in speeding electrical conduction along nerve fibres and in insulating nerve fibres from one another. Patches of inflammation heal spontaneously over several weeks or months when symptoms may resolve completely or residual impairment may result, if they do not. The inflammation causes damage particularly to the insulating myelin sheath covering nerve fibres, but may also damage the nerve fibres (axons) themselves. In MS, the typical damage is often referred to as “demyelination”. The nature of the symptoms and their severity depends partly on the site of the patch of inflammation (or lesion) and partly on its nature and intensity. Using data from the MSNZ funded MS Prevalence Study (2006) and MS Incidence Study (2012-14) it is estimated that about one New Zealander in every thousand has MS. Thus, there are just over 4000 people in New Zealand diagnosed with MS.
Young adults – symptoms usually appear between the ages of 20 and 50 with a peak in the early 30’s. Currently in New Zealand the average age is 37 years old. Women – women are affected approximately three times more often than men. Caucasians – MS is more prevalent in Caucasians (people with ancestry from Northern Europe), than any other racial group. It is rarely found in Maori and Polynesian people and is uncommon in Asian people. The prevalence in New Zealand is approximately 1 per 1,000 with the annual incidence being around 134 people per year. People in cooler climates – generally MS becomes more common the further away from the equator you are. Thus the prevalence of MS is much higher in regions such as the South Island of NZ, Scotland and Canada than it is in tropical and sub-tropical areas. Near relatives – those with a close relative with MS have an slight increased risk. Having a first-degree relative, (mother, father, sibling) with MS increases the chances of having it from approximately 1 in every 1,000 people to 30 in every 1,000. But it is important to note that the great majority of people with an affected first-degree relative do not develop MS.
MS is not contagious or infectious; it is not possible to contract it from close contact with a person with MS.